The list of HoloLens applications continues to grow as more companies discover ways to enhance their operations using augmented reality. Air New Zealand is the latest to show interest in the technology, demonstrating their vision for AR in a new concept video. In the video, Air New Zealand shows how they think the HoloLens will enhance the next generation of travel. By using graphical overlays, flight attendants would be able to "scan" each passenger and obtain information useful for bettering customer service. For example, the flight attendant in the video can see that the passenger he speaks to is feeling anxious. The flight attendant can then adjust his service approach to help calm the passenger. When the passenger feels calm, the HoloLens lets the attendant know so that he can move on to other customers with confidence. Another example shows how pre-set customer data leads to faster, more accurate service. A flight attendant can look at a passenger to see what their preferred food and drink choices are, or if that passenger has any dietary restrictions. Flyers then receive expedited service — which keeps them happy — while leaving flight attendants more time to attend to other matters. That's the pitch, anyway. Would this really boost customer service, or does it present some remarkable hurdles instead? Do customers want their emotions read by a computer? I'm not so sure. 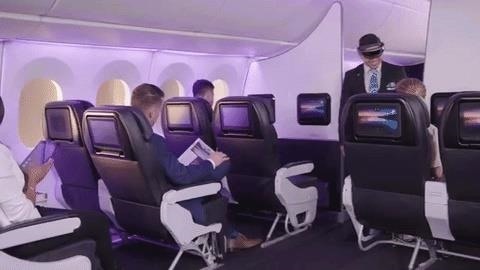 And how comfortable would passengers be talking to flight attendants wearing HoloLenses? The airline wants this to make customer interactions more personal, but right now, it seems like it will make it more ... Creepy. But Air New Zealand seems confident that augmented reality is a necessary and beneficial step for improving flying. And, to be fair, this is only a concept. Maybe by the time the technology is ready for the plane, some of these wrinkles will be ironed out. Don't Miss: AWE Is Here & We Are Giving Away Free Passes!